Abstract: In this column Kerry Hennigan looks at Michael Jackson’s performances of “Earth Song” on awards shows, and specifically the BRITs Awards in 1996 and the controversy that was generated by protests at what some thought of as his depiction of himself as a Christ-like figure. Hennigan, Kerry. 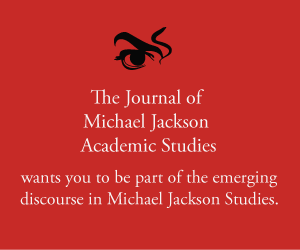 “MJ Studies Today XXVII (14-03-2018).” The Journal of Michael Jackson Academic Studies 5, no. 2 (2018). http://michaeljacksonstudies.org/mj-studies-today-xxvii/. Michael Jackson’s rare live performances of “Earth Song” on award shows were highly theatrical productions employing a chorus of actors, dancers and children all clustered around him at the finale as he transformed from a tattered petitioner to the heavens into a luminous being of healing and salvation. Messianic? Some thought so when he performed the song at the British Phonographic Industry’s BRIT Awards in February 1996. Most famously, Jarvis Cocker jumped onto the stage with Peter Mansell, a former member of Cocker’s band Pulp, and dropped his drawers and waggled his backside at the audience to show his disgust. “Michael Jackson respects Pulp as artists but is totally shocked by their behaviour and utterly fails to understand their complete lack of respect for fellow artists and performers. Cocker insisted he never touched any of the children and was insulted by such an accusation. He was released without charge after spending the night being questioned at the local police station. Predictably, while the official reaction was one of outrage, there were music critics and other artists who hailed Cocker’s behaviour. Melody Maker suggested he should be knighted , and Noel Gallagher of Oasis proclaimed, “Jarvis Cocker is a star” and deserving of an MBE. While no doubt there are some who still consider that Michael Jackson was equating himself with Jesus Christ, more recent – and better informed – analysis of his work reveals its multiple layers of meaning. Whether performed in concert or on stage at an awards show like the BRITs, “Earth Song” was designed to provoke powerful emotions. It was/is nothing less than a call to action in which the iconography employed by Jackson plays a vital role in delivering his message. Melody Maker magazine, March 2, 1996. Joseph Vogel “Earth Song: Michael Jackson and the Art of Compassion”.